Your new solution is up and running… now what? Are you challenged with implementing, managing, and maintaining an increasingly complex spectrum of systems and applications, but don’t have the in-house resources to support them? The kind of support you need goes well beyond a help desk; you need a partner that can provide support for the day-to-day management of your business systems. AKA’s Support and Managed Services team provides that comprehensive support—on demand and cost-effectively. We will continue to be there for you after your solution is implemented or your project is completed. We assign an Account Manager with industry experience to each client—with a full understanding of their implementation—to ensure you continue to be delighted with and are getting the most out of your investment with us. If you’re concerned that ongoing support services is just an extra cost, don’t be. By keeping a relationship with the team that knows your solution and company, you reduced the cost of supporting your solution, and you can reduce internal IT recruiting, training, and retention costs. When you engage with AKA, you are assigned team members who best fit your needs. Your team members stay with you, so you have a familiar voice every time you contact us—and someone who is already familiar with your company, your solution, and your issues. The longer you work with us, the faster your issues are resolved. AKA team members have the expertise and knowledge that enable you to go further and dig deeper, like triaging issues and offering solutions, which you can choose to resolve on your own, or we work with you to resolve them. With AKA’s Client Portal, you can easily submit a question or issue at any time. You need a fast response time so your case is assigned to functional and technical consultants within 2-4 hours, which means we can quickly provide you with an estimate of the time it will take – and get started. You can also track the progress of your case in the Portal—and even the number of hours that have been used (depending on your support plan), ensuring a manageable and predictable spend for support. When you need to make a change—adding new functionality, integrating with other applications, or upgrading your solution to take advantage of new features and technology, we will be there. We can help you determine your needs, build a plan, and execute it—either with your team or as a service so you can stay focused on running your business. We can enhance Dynamics by customizing the base code, integrating it with other applications including those developed by Independent Software Providers (ISVs) in the Microsoft Partner Network, building custom applications, developing reporting strategies, and working together with you on process improvements. An effective partner should be able to provide you with insights to your business systems and processes, provide industry knowledge and guidance to optimize your Microsoft Dynamics investment. 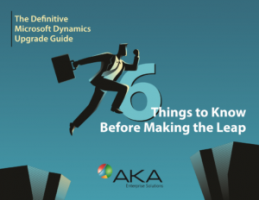 AKA has been providing Microsoft Solutions to customers for more than two decades as a Gold Certified Cloud, ERP, and CRM Partner. If your current software provider is not meeting your needs, or if you are currently not being served by a software partner, consider becoming an AKA client and see how your business can benefit.